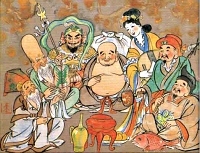 The Seven Gods of Good Fortune (Seven Divinities of Good Luck) are called "Shichifukujin" in Japanese. The Seven Lucky Gods are believed to arrive on a ship full of treasures and bring people good fortune. These are Hotei-ten = the fat and happy god of abundance and good health, Daikoku-ten = god of wealth, commerce and trade, Jurojin = god of long life, Fukurokuju = god of happiness, wealth and longevity, Bishamon-ten = god of warriors, Benzai-ten = goddess of knowledge, art and beauty, Ebisu-ten = god of fishers or merchants, often depicted carrying a sea bream (Tai) and bamboo fishing rod.